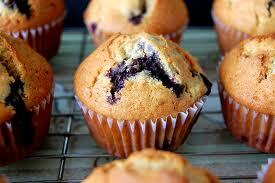 I’ve loved blueberry muffins since I was a girl. They’re even better made with honey! Wash blueberries and toss in sugar enough to coat (about 1 tablespoon). Sift flour with salt and baking powder. Combine milk, honey, egg, blueberries and shortening. Add to dry ingredients, stirring quickly just long enough to moisten dry ingredients. Fill lined muffin pans half full. Bake in 400°F oven for 20-25 minutes or until a toothpick inserted in the center of a muffin comes out clean. Posted in Yummy in the Tummy and tagged Baking powder, Blueberry, Cook, cooking, flour, food, Grandmother Musings, home, Honey, Honey Blueberry Muffins, Honey Blueberry Mufiins, Muffin, muffins, postaday, recipes, Recipes and tagged Bake, Romancing the Bee, Tablespoon, yummy in the tummy. Bookmark the permalink. I saw this on her site, too. They look wonderful! Thanks for reblogging!! I love to cook with honey and share my recipes! !